If you have woken up to find your car marred with spray paint, perhaps by a bunch of cheeky kids, there’s no telling how upset you might be feeling right now. Maybe you applied new white paint on the car just last week, and now it’s ruined with several lines of red spray paint. Well, don’t panic because there are a few ways in which you can remove the spray paint. 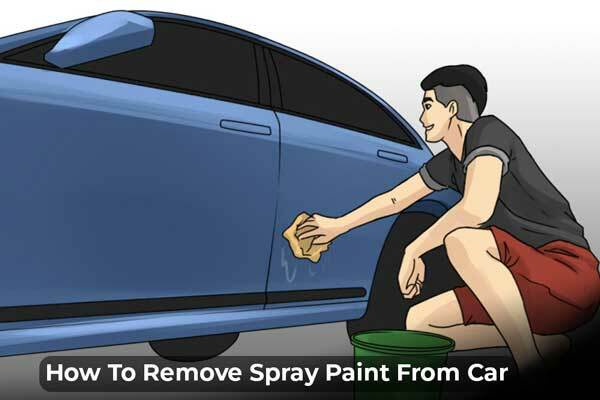 Read on because in this article, we will show you some of the most effective methods of removing spray paint from your car using inexpensive, readily accessible products. The abrasive nature of the detailing clay is what we’re going to utilize to remove the spray paint. Used properly, detailing clay removes the paint without hurting the clear coat. Consider using the Meguiar’s Smooth Surface Clay Kit, as it comes with detailing spray to further minimize the chances of the clay scratching the car’s paint. This kit also includes a microfiber towel and some wax for the job. Where to get it? Online or at your local auto parts shop. Wash the car with soap and water (you can use a bucket a pressure washer) and a couple of towels. The water might even remove some of the spray paint if it is still fresh. Be sure to dry the car thoroughly with clean microfiber towels before using the detailing clay. Put the detailing clay in a zip lock bag and place the bag in warm water (perhaps in a bowl). The clay will warm up, and you will be able to manipulate it with ease. As the clay warms up, apply some lubricant on the surface of the car. The lubricant will prevent the clay from sticking to the surface and rather make it glide over the surface to avoid scratching. Knead some clay in the palm of your hands and rub it over the spray paint. Use back and forth motions, applying moderately firm and steady pressure. Continue rubbing until the spray paint is gone. Note: as you rub the clay in your hands over the paint, it will get covered in the contaminant, and you will have to fold it and knead it again to expose a less contaminated part. Once you’re done applying the detailing clay, use a microfiber towel to wipe off the residue. Using detailing clay causes the wax to come off, so apply a new coat of wax to keep the clear coat shining and protect the car’s paint job. What we need here is acetone, but since you may not have that on hand, you can go for nail polish remover that contains acetone. Acetone is the product that removes the enamel (upper layer of the nail) off. As the finish of your car’s paint job is like the enamel of your nails, the acetone will work the same way to remove the car’s finish. Look at the ingredients list on the side of the bottle, and see if there’s acetone in there. The higher the percentage of acetone, the greater the effectiveness of that nail polish remover. Put on a pair of gloves to safeguard your skin and nails against the acetone and the paint. Pour the nail polish remover (or the acetone) on a microfiber towel (remember, we always emphasize on microfiber to avoid scratching the car’s clear coat). Rub the towel onto the spray paint, ensuring that you’re doing it gently and in little, circular movements. By using gentleness, you avoid scraping the clear coat as you go. Tip: ensure the towel stays wet at all times, and when it starts drying out, add some more nail polish. This will prevent the towel from scratching the clear coat. Follow this process until all the spray paint is gone. All done? Give the car a thorough wash and rinse it, paying attention to the areas that were stained with spray paint, and ensuring there are no spray paint traces left. Liquid carnauba wax contains oils that break spray paint down. Amazingly, the oil doesn’t harm the car’s paint or the clear coat; it only removes the spray paint. Where to get carnauba wax? Online stores or local mechanic parts store. Apply the liquid wax to a clean, dry microfiber towel or a soft sponge. With circular motions and firm pressure, rub the towel onto the affected parts. As you move, feel free to pour more wax on the towel (don’t let it dry up). Again, when the towel becomes stained with the paint, fold it over to expose an uncontaminated part or change to a new towel. As soon as you’re done removing the spray paint, it’s time to buff the wax. Use clean microfiber towels for this, rubbing the waxes parts of the car with gentle, circular movements. 1. The spray paint seems completely dried up. How do I remove it? One tactic would be to use nail polish remover that contains acetone but if that doesn’t cut it, apply baking soda to a damp towel and rub that on the affected areas. If there are still stains remaining, use the detailing clay method. We’re quite certain the stains will be gone by the time you’re done. 2. What can I do if the spray paint doesn’t come off completely? We’re positive that the methods explained above will work but if the car is especially marred with spray paint and waxing, clay detailing, or acetone doesn’t work effectively, then try wet sanding. It’s a more reliable method, but it requires a little more work and time. 3. How can I get spray paint off plastic? Applying detailing clay would be a great way to do it. 4. They applied spray paint on my headlights. How do I remove that? Sorry to hear that. Use fine grit sandpaper, perhaps 1200-grit or higher, to wet sand the headlights. Wet sand meaning that you need to apply a lubricant like soapy water on the headlights prior to sanding.